Semi-finals and finals live on BBC Red Button and BBC Sport website each day of the competition. 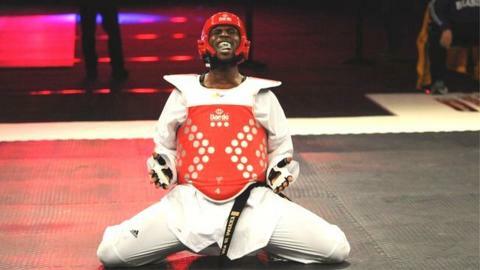 Britain's Mahama Cho won gold at the inaugural World Taekwondo Grand Prix in Manchester with a dramatic victory over Brazil's Guilherme Felix. The Ivory Coast-born fighter trailed 2-1 with just seconds remaining in the +80kg heavyweight division final, only for Felix to incur a penalty. A 'sudden-death' period of extra time was required, and Cho prevailed. "It feels fantastic and I'm really grateful to my family and GB Taekwondo for all of their support," said Cho. "Now I want to be number one in taekwondo." Cho, 24, moved to the UK at the age of seven and represented Britain at the 2011 World Championships in South Korea. However, he grew disillusioned after his weight division was not nominated by the British selectors for the London Olympics and defected to France. Cho won gold medals for France in the Netherlands and Germany this year, but was enticed back to the programme by GB Taekwondo performance director Gary Hall in September. He beat Frenchman M'Bar N'Diaye in sudden-death in Friday's quarter-finals, and South Korea's former world silver medallist and 2012 Asian Games champion, Dongmin Cha, 14-7 in the semi-finals. In other results, Spain's -49kg Olympic silver medallist Brigida Yague Enrique won the first-ever World Taekwondo Grand Prix title, defeating Korea's Sohui Kim 9-1, and Russian world champion Olga Ivanova beat Korea's Injong Lee 2-1 in the women's +67kg category. Saturday, 14 December: -58kg Dominic Brookes; -80kg Lutalo Muhammad, Aaron Cook, Andrew Deer; -67kg Maria Reynolds. Sunday, 15 December: -57kg - Jade Jones, Caroline Fisher; -68kg Martin Stamper, Michael Harvey, Jordan Gayle. Ivanova had beaten Bianca Walkden in the second round, after the 22-year-old Briton defeated Colombia's Pan-American bronze medallist Sandra Vanegas Valderrama in her opening contest. Walden equalled Ivanova for much of their last-16 clash but the Russian moved clear in the final round, winning 9-5. "I'm gutted because I think I was unlucky and I gave it a good fight," said Walkden. "I wouldn't say she is a different level from me but sometimes it happens, and I'm off to the French Open next weekend so hopefully I can redeem myself there." British team-mate and fellow +67kg fighter Stephanie Allen, 21, also went out in round two, losing 7-2 to Mexico's current world silver medallist Briseida Acosta Balarezo. Georgia Barnes, 17, enjoyed an impressive opening round victory over Norway's Janike Lai in the -49kg division, before losing in the final moments of sudden-death against China's former world silver medallist Zhao Li. "I'm proud of myself and I have given 100%, so I can't do any more than that," Barnes told BBC Sport. "It was my first senior competition and I'm learning that they fight much smarter than the juniors and it's a lot more intense."